We don’t always understand God’s love for us. At times we may even doubt it. Life’s tragedies can make us do that if we are not careful. But what we must remember in the midst of everything life throws at us is that God loves us. Even when it doesn’t seem like He does; God loves us. On top of everything else He proved His love for us giving up Jesus to die for our sins. 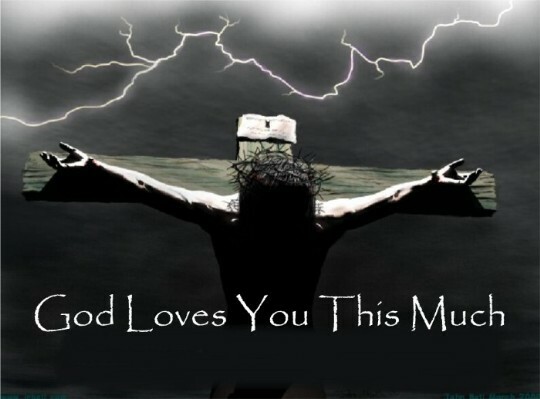 Never forget God loves you. The world and the enemy will try to make you think otherwise, but don’t believe it. Jesus gave His life up just for you. He laid His life down. He cares about you and your eternal well-being. He cares about you now. You may not understand what He’s doing, but trust that He loves you! Oh yes! A song goes,"God you SEEM so far away, a million miles..it feels today!" The beautiful thing is, it "only seems";He is much closer,in our hearts. Amen! His love is so great!